Remind yourself that you're not a fitness freak. Instead, you're the type of person who's gotten into a workout routine that you enjoy enough that you want to maintain when you're on the road. With all the fabulous culinary temptations in the Windy City--brunch, burgers, hot dogs, pizza, food tours, etc.--staying on track may be challenging. That's why top Chicago fitness pro Michael Wollpert recommends mixing a guilty pleasure or two with your regular routine. "'I'm on vacation' means all bets are off and I can eat whatever I want. This is a mistake," warns Wollpert, who works as a personal trainer as well as an instructor at Equinox. "Perhaps have an attitude of I can enjoy one or two restaurants or experiences with the rest of the trip, eating clean and hitting fitness for fun as well." Lucky for you, many Chicago hotels are equipped with gyms (also see top Chicago boutique gyms), but if you want to step it up a notch or two, we've gathered an impressive list. Choose from a property boasting a full-size basketball court to several hotels featuring aerobic, running and yoga classes. The Details: Located on the 40th floor of the Chicago Stock Exchange, The Buckingham Hotel is ideal for the savvy business traveler. It's on the same level as the romantic Everest restaurant and offers similar views of the city's spectacular skyline. The gym is complimentary for hotel guests, yet children are not allowed during the week. Cardio equipment includes treadmills, elliptical trainers, stationary bikes and rowers. Why We Love It: There's an updated golf performance center, featuring integrated swing coaching, golf-specific fitness training, rehabilitation and custom equipment fitting. Golf enthusiasts will also appreciate the full 3D motion capture, TrackMan Launch Monitor system and simulator. There are daily BARRE, boxing, boot camp, spin and yoga classes; also pool and basketball and racquetball courts. Address: 440 S. LaSalle St. The Details: Guests of the Fairmont Chicago, Millennium Park may purchase a $20 day pass at the front desk for Lakeshore Sport & Fitness, Illinois Center, which is located directly around the corner. The facility is more than 120,000 square feet and its central focus is the tallest indoor climbing wall in the country, which spans the length of the club. The hotel is also close to Millennium Park. Why We Love It: The gym is a fitness enthusiast's dream: It contains a boxing studio, eight-lane indoor pool, outdoor pool with sundeck, group fitness classes, golf simulator and putting green, group cycling studio, Pilates studio, yoga studio, running track and squash courts. The Details: Those planning to stay at Four Seasons Hotel Chicago should take advantage of the discounted day rate of $25 at Equinox Gold Coast. Both establishments are under the roof of the 900 North Michigan Shops, and the latter boasts a luxury 30,000-square-foot space with a junior Olympic-sized pool and four group fitness studios. Why We Love It: That luxury extends to Kiehl's Since 1851 bath and body products in the locker rooms as well as eucalyptus-scented towels. Extra-busy people should appreciate Equinox's newest class, Firestarter--a 30-minute workout that gives new meaning to cardio HIIT training. Participants use their own body weight and step bench to go through innovative and fast paced sequences offering a complete cardio challenge. Address: 900 N. Michigan Ave. The Details: Located directly across from House of Blues, Hotel Chicago Downtown is a boutique property with 354 guest rooms and suites. It's also in the same building housing SPiN, an intense, yet fun ping-pong club founded by Oscar-winning actress Susan Sarandon. Why We Love It: The social club is nightlife oriented--with deejays spinning regularly--and is a great way to shed pounds with friends. It's open late night seven days a week, which should be enticing for someone looking to work out during unconventional times in a lively atmosphere. And if you're drinking, there are craft cocktails behind the bar. Prices for ping-pong range from $15 for a half hour during off-peak hours to $39 an hour during peak hours. The Details: The Intercontinental Chicago Magnificent Mile upgraded its fitness center in 2016, and that included a new name: the I-Club. It now offers new elliptical and bicycle machines, but the big attraction is the junior Olympic-sized pool, which has been around since the 1920s. The historic pool was also renovated, yet it maintains the historic nature of the space, keeping the striking blue-toned mosaic tile and classic stone trimmings. Why We Love It: If you've hit a plateau in your routine and not seeing any progress, the gym has a personal trainer, who may offer advice and one-on-one sessions. Address: 505 N. Michigan Ave. The Details: Double Tree by Hilton Hotel—Magnificent Mile is undergoing a multi-million dollar renovation and it will be the very first in the Midwest to have Five Feet to Fitness Rooms, an innovative in-room wellness concept. Guests will have several fitness options to choose from, based on interest, ensuring that travelers can stick to their fitness routines while staying at the hotel. Why We Love It: In addition to the added amenity, guests can also work out at the hotel's Fitness Room, which features treadmills, stationary bikes, free weights and more. Or, take a dip in the newly renovated swimming pool (set to open this summer). Address: 303 E. Ohio St. The Details: Financial District newcomer Kimpton Gray Hotel is only minutes away from the trendy West Loop neighborhood and Chicago Theater District. It's also home to a 24-hour fitness center with a smattering of state-of-the-art equipment like PreCor TRM 885 treadmills, PreCor RBK 835 recumbent bike, the PreCor FTS glide and two Peloton bikes, with 22-inch HD touchscreens. Why We Love It: Pack light and leave your fitness clothes at home. Kimton Gray offers Lululemon clothes—for men and women—that you can check out at at the front desk or purchase to bring home. Lululemon premium yoga mats are also available, ensuring your can continue your workout routine while away from home. Address: 122 W. Monroe St. The Details: Only hotel guests get to enjoy the four pools located on the property of the Radisson Blu, located a block away from Millennium Park. Those who head to the third-floor terrace, 25-meter lap pool are treated to a number of amenities, including a children’s pool, dedicated yoga space, hot tub, sauna, sundecks, fire pits, cabanas and seasonal outdoor bar. 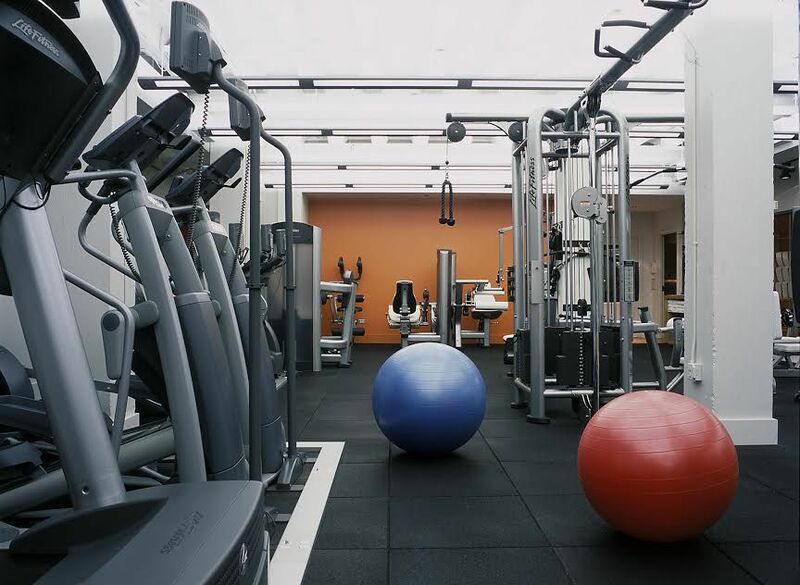 Why We Love It: The 8,000-square-foot fitness center is equipped with state-of-the-art cardio machines, weightlifting equipment, spinning facility and full-size basketball court. Address: 221 N. Columbus Dr. The Details: The London-based hotel group opened its first property in the Midwest in 2014. Situated in the West Loop, Soho House Chicago takes over a six-floor historic warehouse dating back to 1907. The property's "small" and "medium" bedrooms range from 300 square feet to 500 square feet with king-sized beds topped with Egyptian cotton sheets as well as walk-in rainforest showers. Why We Love It: Members and hotel guests also have access to a 15,000-square-foot gym. Its amenities include: a professional boxing ring, Technogym equipment, two fitness studios, men and ladies lounges, and steam rooms. The Details: The world's first-ever Virgin hotel opened in the Loop in 2015, and it combines a personalized hotel experience with the personality of Sir Richard Branson’s global Virgin Group. If you cannot bear to tear yourself away from work, Virgin Hotels Chicago's gym assists you in multitasking. The internet-equipped Technogym cardio machines range from treadmills to elliptical trainers. Why We Love It: The rooftop gym is located on the 25th floor and offers some great views of the city's famed architecture. Address: 203 N. Wabash Ave.
What Are the Best Sushi Bars in Chicago?